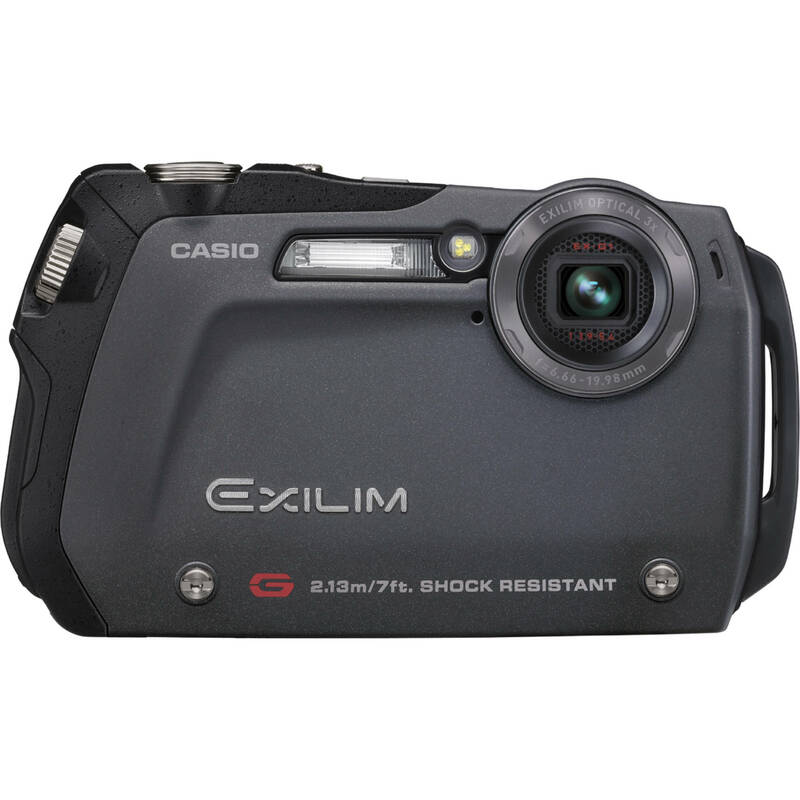 Casio Exilim EX-G1 Digital Camera (Black) "High Endurance Extreme Shooting Gear"
The Casio Exilim EX-G1 (Black) Digital Camera is High Endurance Extreme Shooting Gear designed to fit your active lifestyle. This slim-line camera is designed to take a beating and still take amazing images and video. The camera's two-layer construction has an outer body made from stainless-steel to withstand shock, and a waterproof inner body made from polycarbonate. There is also a rotating lock for the external memory slot cover and the strap holder is made of die-cast zinc, all of which make this tough little camera waterproof, dust-proof, freeze-proof and shock-resistant. The camera features many Best Shot Modes, including an Underwater setting to keep underwater photos from looking too blue. There is also an interval shooting function that can be set at 10 seconds, 30 seconds, 1 minute, or 3 minutes. The capture time for movies can be set at 3, 10, 20, or 30 minutes. This is perfect for capturing images of action sports including cycling, snowboarding, and wind surfing. All of these features, along with the 12.1MP resolution, 3X optical zoom, 2.5" LCD screen, and 16:9 wide-format movie mode make this camera perfect for an active lifestyle. The camera meets the IEC/JIS Protection Class 8 (IPX8) and Protection Class 6 (IPX6) waterproofing standards. The camera can be used underwater up to 10' (3m) for 60 continuous minutes. Water will not penetrate the camera even when directly sprayed with jets of water from every direction. You can drop your camera multiple times from a height of 7' (2.13m) without damage. You can take photos in the desert or the beach without worrying about your camera, since it is dust-proof with an IEC/JIS Protection Class 6 (IP6X) rating. Take photos at the North or South Pole, or anywhere the temperatures are down to 14°F (-10°C). The Best Shot function enables users to take beautiful photos by selecting the desired subject scene. The EX-G1 includes Best Shot settings suitable for various outdoor situations, such as "snow" and "beach" scene settings, which automatically adjust to prevent overexposure. There is also an "underwater" setting to prevent your underwater photos from looking to blue. The interval shooting function allows users to automatically take still photos or movies at fixed intervals. The shooting interval can be set at 10 seconds, 30 seconds, 1 minute, or 3 minutes. Movies maybe set at 3, 10, 20, or 30 minutes. The camera can detect faces automatically and adjusts for optimum focus and brightness to optimize the appearance of the faces in your image. The camera even follows the movement of moving subjects, which simplifies shooting images of active kids and pets. Exilim EX-G1 Digital Camera (Black) "High Endurance Extreme Shooting Gear" is rated 4.2 out of 5 by 50. Rated 5 out of 5 by Anonymous from Great things come in small packages I use this camera to photograph firefighting activities. I needed a quick and easy camera to operate when duty calls. The camera has proved tough enough to withstand heat, cold, water, and shock as it is carried inside my bunker gear. The images are superior as well. Rated 3 out of 5 by LEO from Good, , but would expect more this was my first underwater test. i took it to the swimming pool, (about 4 ft). For the first 2 days , it was normal, but in day 3 after the recharge, I notice water condentation behind the glass covering the lens and back to the LCD panel and the red eye reduction led. It took about 5 minutes facing directly the sun and it was ok. but repeted after and after. I could not see water neither in the card compartmnet, nor in the battery one, but it was anoying having to stop time to time. I could see bublles trought the battery switch, the opening holles for the microphone and speakers.I thing this is normal, or is like that anyway. Rated 4 out of 5 by alfredo benitez from very good camera great camera for outdors i tasted it on the beach like 5 times and nothing happened, i really swam with the camera, it can take videos and photos underwater but in the ocean its almost imposible to have good pictures if you want pictures underwater its better going to a pool, i really recomend this product, but i dont like its use on the night i take too long to take one picture and they are not very good, excellent design i feel very good carring the camera and it is not so expensive talking about all the beneficts that it have. probably you will find other camera at the same price but not with all the benefits that it have. Rated 4 out of 5 by Looking West from Rugged Tradeoffs Rugged and slim construction with some tradeoffs. Good value if shock resistance, waterproof, dustproof, freeze-proof requirements are top priority. Ideal point & shoot for outdoor activities. Auto selections result in only fair image quality and resolution, especially in low light/cloudy conditions. Best Shot modes can be customized by the user to improve image quality by altering exposure, focus, color saturation & contrast settings. Special features include video (not HD), interval photos, and dynamic photos (insert moving subject into another image). Tradeoffs to consider are the limited zoom (3x), software lacking post-production image processing. Takes mini-SD card. Rated 5 out of 5 by Anonymous from Excellent, with one glitch When I first saw this camera in a local camera store I knew I had to have it. ...The Camera works great and has tons of features. I took it on a cruise were I used it underwater. I knew it had a limit of 10 feet (30 meters) but for some reason, after using it just fine underwater, the camera screen did not want to turn on. I left it alone for a few days and now it is back in action. I am not sure what happened but other then that it has been an excellent camera. Rated 4 out of 5 by Anonymous from Excellent! I bought this on a whim to take with me on a trip to the Caribbean. I was looking for quality photos from a compact camera. I knew it was a lower megapixel, low zoom camera going in - that's what this camera is. That is exactly what I got! I am a complete camera novice. This little find was extremely easy to use, a dream to carry around, and passed the underwater pic test. Although it didn't work great in the hot tub, but I blame the bubbles. One star off because somehow I hit something that locked the flash in off, and it took some menu surfing to get it back to auto. Should be easier. Rated 4 out of 5 by fthegreat from Great Value first waterproof digital camera i owned. didn't want to go for big bucks for the ones that go 33feet deep. The casio g did the trick. i used it in the pool, the beach and even while snorling and zip lining. Take great indoor shots also. definitely worth the money. The only negative is that you have to remove the battery to charge it and they don't tell you that you need to make sure that when you come in from the heat to make sure the camera cools down before you remove the battery or you might get some condensation in it. Rated 4 out of 5 by G David Photo from Cool camera I took this cool camera on a trip to Mexico. I wanted to be able to take shots in the pool and ocean without all the expensive and clunky gear for my Nikon. I took shots and video while snorkeling, getting banged around in the surf, dinner, on the beach, in the rain, at night and at the pool bar! almost anywhere you could and was very pleased with its performance. It performs as advertised as far as water and dust proof go. I still do not want to test the 7' drop feature. The only thing that is a draw back (and it is a minor one for what my needs are) is that the optical zoom is only 3x. Still at 12MP cropping should not be an issue to get the shots you want. Color is vibrant and most shots are sharp as expected. Low light wasn't an issue either. All in all very happy with my purchase.